It might surprise you to learn that, on average, we do 144 miles of ironing over our lifetime. With many people spending at least 1.2 whole days per year ironing. Yes, wrinkles and creases can be quite vexing, and many of us don’t enjoy ironing. But, its not all bad news. Apparently around 25% of us find ironing quite a therapeutic task and use it as an excuse to escape our family for a time. Not only that but the introduction of powerful steam generator irons help make this task not only easier but much faster too. In this guide you’ll find out everything you need to know about steam generator irons before you buy. From reviews on the best irons available in the UK to finding out tips on what to look for – we have you covered. Do you find yourself wishing that your iron would work a little faster at smoothing out creases on heavy garments? Perhaps you hate ironing time because of having to adjust the temperature dial over and over. Well, whatever your qualms are with your current iron, the Philips GC9630/20 Perfect Care Elite just might be the answer to your ironing woes. Dubbed as Philips’ best and most efficient steam generator iron, the PerfectCare Elite brings a completely new level of ease and convenience to your ironing. 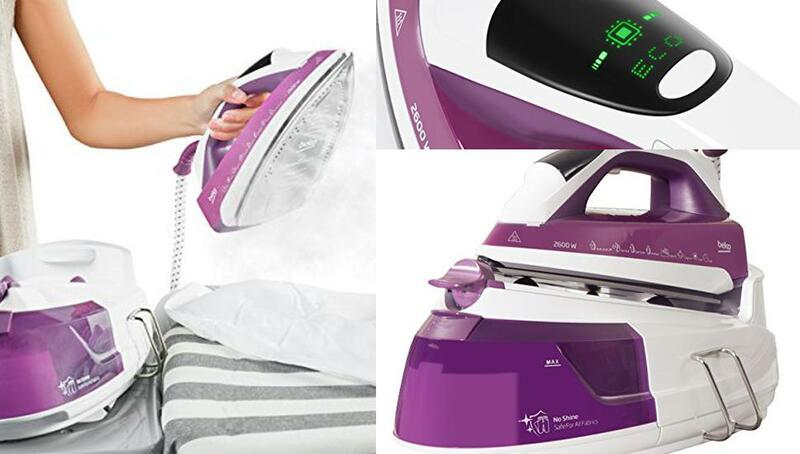 From automatic operation and saving on energy to offering protection against burns and going easy on your hands and wrists, this steam generating iron delivers on every front. Find out all about the cool list of features that make up the Philips PerfectCare Elite in our in-depth buying guide below. The thing to love about the Philips PerfectCare Elite is that it does not feature a temperature dial. Instead, the steam generator iron is equipped with OptimalTEMP Technology, which comprises of an advanced smart control processor fitted inside the iron. The processor calculates the right amount of heat and steam output needed for optimum ironing results (with guaranteed no burns). It automatically adjusts to the required settings depending on the particular fabric being ironed. So, you can forget about ironing your silks gingerly, sorting clothes beforehand by fabric type, or waiting for the temperature to adjust after changing the settings. 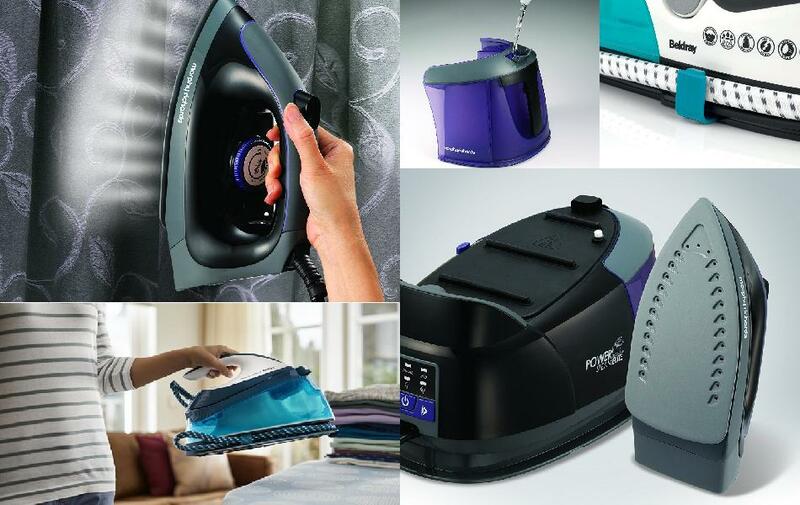 Simply switch on the PerfectCare Elite, and iron away. 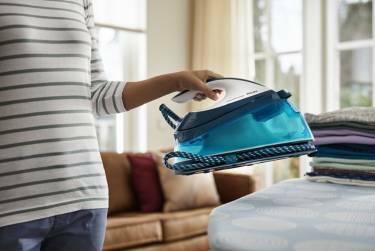 One of the benefits of owning a steam generator iron is that these appliances can cut down your ironing time by up to half. Keeping up with this promise, the Philips GC9630/20 Perfect Care Elite combines precision with the power to make quick work of ironing. It all starts with the OptimalTEMP Technology, which ensures the right amount of steam is produced for every fabric. This steam, in turn, is delivered in a pressurized manner at a powerful bar pressure of 6.7 – one of the highest around. It gets better! The steam is delivered consistently at a rate of 135g/minute with an extra steam boost of 470g for tough creases and heavy fabrics. To top-it-off, the shape and vents on this steam generator’s soleplate are designed to ensure optimum steam distribution for even faster crease removal. All of this combined makes it possible for you to power through stubborn creases rapidly while exerting very little effort. At the end of it all, the PerfectCare Elite saves you an impressive 40 minutes of iron time every week (on average). To activate this fast and powerful steam, you press the ‘ON’ button at the back of the appliance’s base and steam will be ready to use after 2 minutes. After that, a gentle squeeze on the button/trigger under the iron’s handle will send steam oozing out. Pressing the trigger twice results in a continuous flow of steam. Limescale is a nightmare for steam generator irons. It builds up within the iron, ultimately degrading the steam performance. This, however, is not something you will have worry about with the PerfectCare Elite steam generator. The appliance features a self-running descaling system, which draws impurities from water as iron heats up and sends them down to the water tank. Following 10 hours of use, a light at the back of the steam generator base will start flashing followed by a hard to miss alarm indicating it is time to descale. At this point, you just need to open the Easy De-Calc shoot and discard the available dirty water. The sound and flashing will stop and the descaling cycle will start up again. Have a ton of ironing to do? No worries as the PerfectCare Elite has you covered with an endless supply of steam. For one, the available water tank has a huge 1.8L capacity, which is enough for up to 2 hours of continuous ironing. Should you need to go on after that, you can simply refill the tank without switching off the iron and waiting for it to cool down. The tank detaches from the appliance and has a large filling hole that makes it possible to pour in water without it spilling over the sides. Compared to an average iron, the Philips GC9630/20 Perfect Care Elite steam generator appears much larger and bulky. But that is only because of the 1.8L tank, which makes up the unit’s base. The actual hand iron that you will be using weighs less than a kilo and is fitted with Philips top-of-the-range T-ionic Glide soleplate. Thanks to this design, the iron feels weightless in your hand and moves effortlessly over clothes. Consequently, you can go through a heap of clothes and not feel like you have done any work. Philips is a name you can trust when it comes to irons and the PerfectCare Elite certainly does not disappoint. It is a high performing steam generator that is easy to use, fast, powerful, efficient, and practically weightless in your hand. Definitely one of Philips best work. When it comes to steam generator irons, there are 3 main reasons people generally opt out of investing in these appliances. The first two are high prices and the large & bulky design of these appliances, which take up more space than both regular and steam irons. The third reason, which touches on the noisy nature of steam generators, is more of a complaint than a dissuading factor. All steam generators make some kind of noise, which many people find annoying as it makes it difficult to watch TV and iron at the same time. With the Beko SGA7126P Smart SteamXtra Steam Station, all of these 3 pitfalls are eliminated. Beko broke the mold with this neat little steam iron generator to create a powerful compact unit with fairly quiet operation and a fantastic price tag of under £100 (at the time of writing). In theory, this appliance is a perfect all-round steam generating iron that is suitable for everyone and all ironing tasks. But, will it work for you? To find out, read about the features of the Beko SmartXtra Steam Station in our detailed buyers guide below. If looks were anything to go by, you would not be wrong in not expecting much from this Beko Steam Station in way of steam performance. For one, it only measures 31 x 17 x 24 cm, which is much smaller than most steam generator irons. At first glance, the soleplate design might also elicit some concerns. It is very simple in appearance and is not riddled with lots of holes, which would at least help with generating more steam. However, underneath it all, this Beko Steam Station is actually a deceptively powerful appliance. Steam pressure stands at a powerful 6 bars, which is more than enough to eliminate every crease (including deeply ingrained ones) in the iron’s path. To get the steam going, there is a trigger button under the handle, which you will need to press and hold. Doing so results in a continuous steam output of 110g/min and extra shots of 340g/min. If you let go of the button at any point, steaming will stop. Another unexpected performance feature of the Beko Smart SteamXtra comes from the iron’s soleplate. Although little in number, the holes on the soleplate are so placed by design. 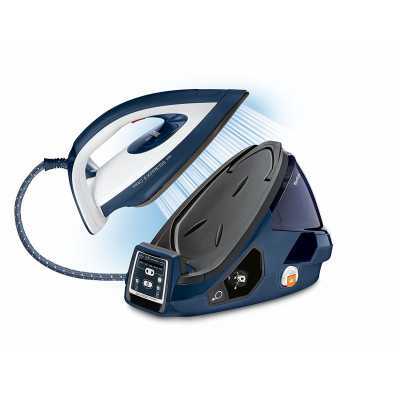 The iron features SteamXtra Technology, which lets out steam through the soleplate holes in ‘criss-cross’ angles that penetrate deep into your garments to achieve superior ironing results. Also featured on the soleplate is a narrow tip that makes easy work of ironing around buttons and other small awkward spaces. If you love the one-temperature-setting-for-all-fabrics function of steam generators, you have one more reason to invest in this Beko SteamXtra Smart Station. When you turn on the steam generator, it automatically activates its default setting of a Smart Eco Mode. Ideal for all ironable fabrics, the Eco mode prevents the iron from getting too hot by adjusting its temperature and steam to the perfect levels required for the particular material you are working on. Given its adaptable nature, the Smart Eco mode alone is enough to meet all your ironing needs. But, if you find yourself needing more heat, the Beko SteamXtra Smart Station provides 3 more settings of ‘Low’, ‘Medium’, and ‘High’ temperatures. Switching through all 3 settings plus the eco mode is done via a tiny button on the topside of the iron’s handle. Every steam generator iron needs some sort of anti-calc system if it is going to last. With the Beko SteamXtra Steam Station, this is provided by means of a cartridge filter, which you will need to insert into a small slot at the top of the steam station before you start using the appliance. The cartridge does a great job of collecting lime from the water tank as you go about ironing. The only problem is that it has a limited lifespan of 30 litres of water (or less if you live in a hard water area). Therefore, it will need replacing at some point, which is an extra cost you will incur. Beko packs the appliance with 2 cartridges so that you will have the first replacement ready to pop in when needed. After that, you will have to buy more of these limescale filters at the cost of around £18.99 apiece. 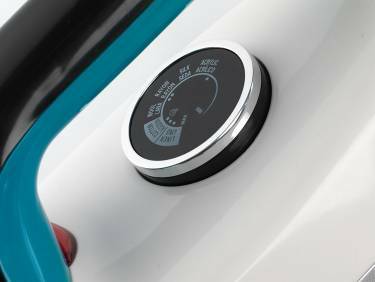 For a bonus feature, the Beko SteamXtra Steam Station offers a digital panel situated on the handle next to the setting button. The panel is simply a friendly reminder, which displays the current setting, alerts you when water is low and tells you when to descale. The steam trigger button is placed directly under the setting button. This makes ironing slightly uncomfortable, as you always have to be careful not to accidentally press the setting button as you are holding onto the steam trigger. One thing that stands out with the Beko SGA7126P Smart SteamXtra Steam Station is a clear lack of bells and whistles found in the likes of the Tefal Pro Express Care and the Philips PerfectCare Elite. However, this is to be expected, as the SteamXtra Steam Station is a lot cheaper than most steam generators. If anything, the steam generator is a very impressive appliance since it provides all of the important features. The iron hand is light, soleplate smooth, cord a generous length, steam pressure more than decent, anti-calc performance satisfactory, and the whole appliance well built. For the price and size, it is a seriously good buy. The Morphy Richards 333020 Jet Steam Generator Iron is another great addition to the Morphy Richards range and comes in a pink and white combination that complements its lightweight nature. This particular model has been on the best seller list on Amazon UK for a while now, attracting thousands of customers all over the world due to its beautiful design and comparatively low price. The best thing about this model is that its size is ‘regular’ for an iron (category C) and works well with the standard iron board. This means it sits nicely in place and is stable when on almost any board without the risk of it falling off because it is too large. At the front end of the iron handle, there is a big press-button to trigger the water spray. This feature is excellent for removing stubborn creases because you can deliver extra bursts of water precisely where you need them. Below the iron handle, you find the steam releasing button, which is fairly easy for the finger to feel and operate. Once pressed, it releases 100g of steam to deal with heavier fabrics such as linen and denim or to bust through stubborn creases! The soleplate is stainless steel, ensuring durability and efficient heat delivery. You can remove the tank from the front and refill it with ease. 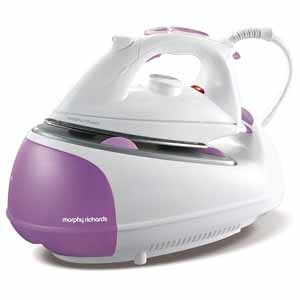 You don’t even have to stop ironing because the Morphy Richards 333020 features a continuous-fill boiler. When filling the tank, it is recommended to use distilled water to ensure the proper working and longevity of the steam generator. The replaceable anti-scale cartridge makes maintenance easy, resulting in a long-lasting product that’s guaranteed to give you consistent performance over the years. To begin ironing your clothes, you have to allow the steam generator a couple of minutes to get ready. This time may seem a bit longer than Morphy Richards Power Generator Elite series but, by no means can we call it a big drawback. The handle where you grip the iron might be a tight squeeze for some because of its size. Immediately below the handle, you can find a heat controlling dial with standard low, medium and high indicators. 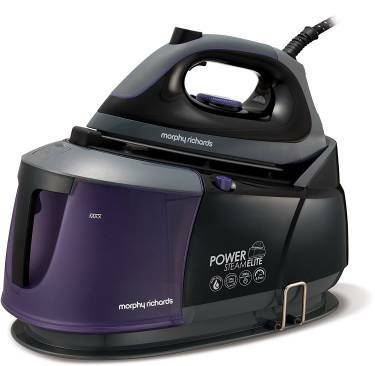 Overall, in our opinion, it is an economical yet effective steam generating iron from Morphy Richards and definitely worthy of consideration if you are looking at steam generator iron which won’t break the bank. It’ll get the job done but comes without some of the features such as larger water tank and cable tidies etc you will find on slightly higher priced models. Are you looking for an iron that won’t burn your clothes? From silk to jeans, the Philips PerfectCare Compact Steam Generator Iron boasts the latest OptimalTEMP technology which makes it virtually impossible to burn your clothes. 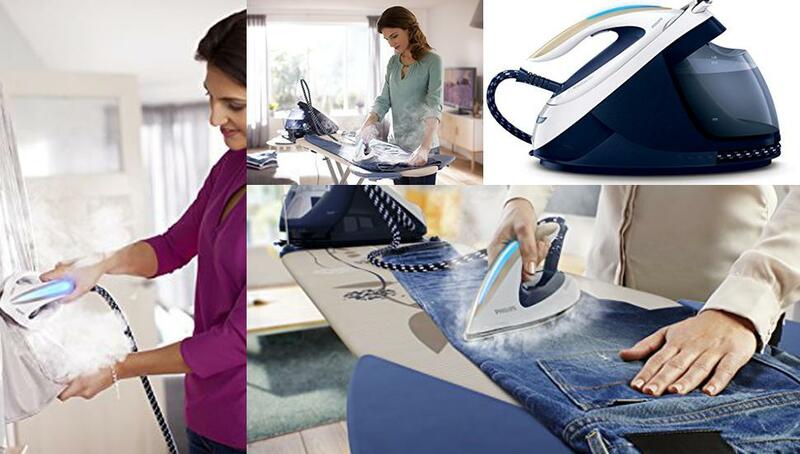 Philips even claims you can leave the iron face down on the fabric and there is no chance of burn or shine. The GC7805 design is similar to that of the GC7808 except for the colour. The Philips GC7805 PerfectCare Compact Steam Generator Iron is bright which makes it more attractive and eye-catching – for an iron! The first thing you’ll need to do is fill the water tank. This can be accessed using a small lid located on the front of the device. After filling you are ready to switch on the iron. A soft light running along the handle will illuminate indicating that the iron is ready for use. Looking at the back of the tank, you will notice there are three illuminated buttons. On the left, is the Eco-button which turns from blue to green when pressed, inidcating that Eco mode is active. In the middle, there the ON/OFF button and on the right, there is a descale button. The iron will beep and the red light of the descale button will indicate when the system needs to be descaled. The steam releasing press-button is under the handle of the iron at a comfortable resting place for the index finger. Which makes getting regular bursts of steam easy when you’re tackling a mountain or ironing! To lock the iron on the resting platform, there is a white button just above the lid of the 1.5L water tank. As you push the lock-in, it will hold the iron firmly in its place. Which is a great safety feature and helps make moving the iron and attached tank much easier. Above we mentioned that the iron will alert you when it needs descaling. To do this you will need to use the supplied descaling dish. Although this might initially sound a little itimidating to use, it is in fact very simple to operate. Place the iron (Switched ON) on the dish and press the descale button on the back of the unit. Let the system work for the next five minutes after which it will automatically stop once done. And, thats it! The Machine will have just cleaned itself. If you need extra steam to press tough clothing such as jeans, just keep the ON/OFF button pressed for a couple of seconds. There will be a light change from blue to white which indicates the initiation of Turbo Boost. If for some reason you forget to turn the iron OFF and go out of the room, the automatic Turn-Off feature will kick into effect automatically switching the iron OFF. This is a great safety feature especially if you have children or pets in your home. Being the first Woolmark Gold seal earner, Philips GC7805 PerfectCare Compact Steam Generator Iron certainly has an edge over its competitors. 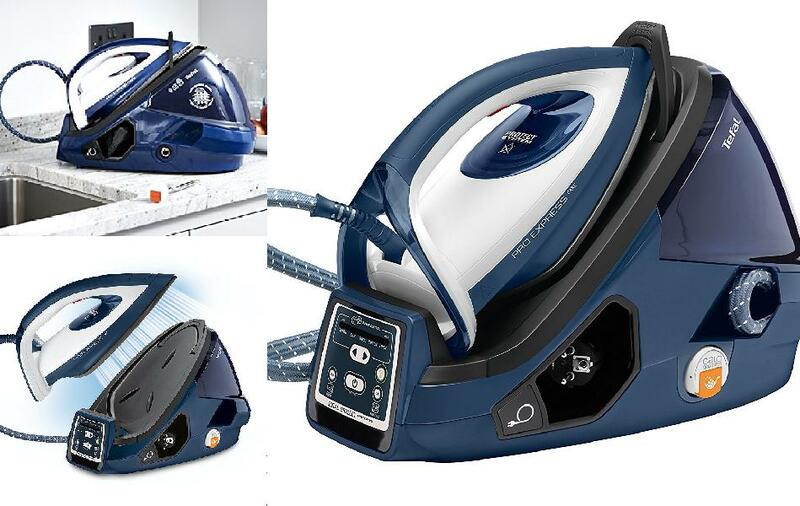 Its myriad of useful safety features ranging from OptimalTEMP (so you never burn your clothes), automatic switch off feature and Turboboost mode (for tackling stubborn creases or heavier items of clothing) makes this iron one of the best available today. It is loaded with innovative features that we’re sure will make the chore of ironing just that little bit easier. Ironing laundry is one of those chores that many people admittedly dislike. It is tedious, boring and time-consuming. But, ironing can feel like less of a chore if you decide to invest in a good steam generator iron like the Tefal GV9071 Pro Express. By blasting jets of steam at 500g/min, this appliance will loosen individual fibres in even the toughest denim jeans or thick bedding linen. As a result, the iron’s hot soleplate and pressing action smoothen out creases with ease. In order to determine whether this Tefal steam generating iron is worth buying, having a bit more information about it is necessary. In this guide, you can learn more about the appliance and figure out if it is right for you. How easy is it to Operate Tefal GV9071 Pro Express? Like any other steam generator iron, the Tefal GV9071 Pro Express is a two piece unit. It comprises of the base with a boiler and water tank as well as the separate iron connected to a steam hose. A slanting rest plate with non-slip pads holds the iron when it is placed on the base. The resting plate is heat resistant, which serves as the ideal spot to place your iron when taking breaks. And, as an added bonus, the carry handle on the base lets you transport the entire appliance to your ironing board easily and in one trip. Operating the GV9071 Pro is quite simple. First, you have to fill the water tank. It comes off by pulling back the visor-like cover over the iron and disengaging a locking handle. Once detached, you can fill the tank with tap water until it reaches the max fill mark. The tank clicks into place when pushed back to its housing. After plugging in the power cord, pressing the on/off button on the control panel behind the base unit powers up the boiler. It takes about two minutes for the iron to warm up. The light on the iron and selected preset button keep blinking until the iron is ready for use. Just under the iron’s handle, you will find the steam control trigger button. When pressed and held down, it allows steam to exit through the perforated soleplate. Releasing the button cuts off the steam output, allowing you to spray the required amount of steam at any given time. Water trickles into the boiler every minute to ensure a continuous steam supply and a handy red light flashes to let you know when the water tank needs refilling. Compared to its counterpart, the Tefal GV9061, this particular model has an extra two programmed settings. In total, there are five ironing presets that automatically adjust steam output and temperature control at the push of a button. Ideal for delicate fabrics like nylon, acrylic, acetate and polyester, the Synth setting does not let out steam. If you want to iron with steam, the other four buttons come in handy and they include the Silk, Wool, Cotton, and Linen presets. Although the Tefal GV9071 can use up to 2,400 Watts to power through stubborn creases, you can reduce energy consumption for any selected mode by pressing the eco-button. When left idle for 8 minutes, this iron automatically goes to standby mode. The boiler turns off completely after 30-minutes of non-use. This auto-off function is another energy saving feature that will be very useful should you forget to turn off your iron. Maintaining the Tefal GV9071 Pro is fairly easy thanks to the built-in scale collector. The collector has a rod, which screws into the boiler. After every 10 uses, the Anti-Calc light & OK button flash in orange, signaling you to de-scale your iron. Descaling simply involves soaking the collector rod in lemon juice or vinegar for a few hours and rinsing the boiler after it has cooled. The Tefal GV9071 Pro Express may cost more than an ordinary iron, but it should be worth every penny considering the time and effort it will save you. In fact, even standard steam irons like the Breville Press Xpress or Russell Hobbs 20630 Powerstream Ultra pale in comparison to the generous 1.6L water reservoir and 7.5 bar pressurized steam generator that comes with this unit. This means less time spent between refills and plenty of steam power to loosen stiff fabric. Overall, the Tefal GV9071 Pro offers excellent value if you are looking for an appliance that will cut back on your ironing time and power through stubborn creases. Steam generator irons certainly have a lot of benefits over their traditional counterparts. However, how do you go about buying such an iron? And, what factors should you consider? Pressurised steam generator models, on pressing a trigger, give out a powerful blast, ironing out stubborn creases with ease. Non-pressurised steam generator irons work similarly but produce more steam. These non-pressurised irons come with a separate water tank for convenient refilling, which can often hold around 2l of water, allowing you to tackle even the largest ironing chores with ease. Why should you consider soleplates when choosing an iron? Thin soleplates with slim nose points, as opposed to their thicker counterparts, glide smoothly on clothes. They also don’t snag on buttons and zips when ironing either, making them a good option if you need iron a lot of shirts or blouses, for example. This feature is very convenient as it enables easy refilling of the iron. Another tip concerning the water tank is to always ensure that you purchase an iron with a clear water tank so that you can easily see the water-level when refilling or ironing. Did you know that leaving an iron ON is an accident waiting to happen? Each year, irons account for around 30 house fires in the UK (according to a study conducted by Which?). This is why it’s important to look for a steam generator iron with an automatic shutdown feature. Not only will it help prevent nasty accidents, it will also help cut down on your energy bill too. Having the iron locked to the base is beneficial in transporting and carrying. This increases safety as the iron lock reduces the risk of the iron falling and causing damage of any sort. For many people, a steam generator iron might appear to be just new version of the regular steam iron. But, this is not really true. While it’s true that both irons do the same job, i.e. iron clothes, HOW they operate is different. Steam generator irons were designed to help simplify your life by allowing you get through your ironing in the shortest time possible. They produce more steam, and when faced with a pile of laundry, the more steam you have, the better. 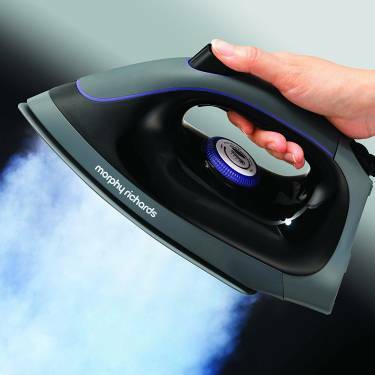 Steam generator irons are more efficient and are arguably better than regular irons. Both types of irons have their benefits and similarities of course; however, they also have their differences. Let’s take a look at these differences below. 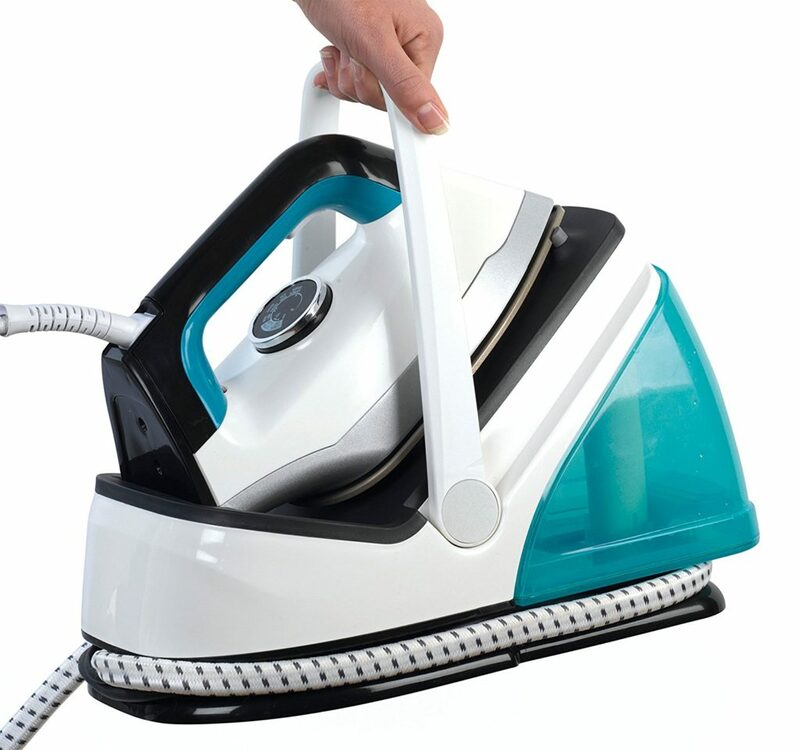 The size and design of steam generator irons and regular irons is clear to see. Regular irons are single units. When you want to use them all you have to do is plug them into an electrical socket and begin ironing. 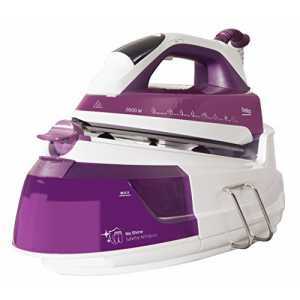 Steam generator irons, on the other hand, are bigger in size and have two different units, one of which is the iron itself and the other is the base unit. The iron and base unit are connected to each other by a hose. To commence ironing, you first have to plug the base unit into an electrical socket and allow it to heat up. The base unit is where the water is stored and steam generated. Steam travels through the connecting hose to the soleplate of the iron. This is another important difference. 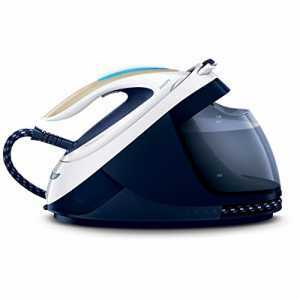 A steam generator irons steam producing capability is far greater than that of a conventional iron. What makes steam generator irons more efficient at removing creases is this production of large amounts of steam. This steam production allows you to iron faster, more efficiently, and with more ease. Put another way, we could compare the two irons using the following analogy: You can wash your car using a pressure washer or an ordinary hose-pipe. Both will clean the car but the former is faster and easier. A steam generator iron and a regular iron will both get your clothes ironed but using the more powerful option will greatly reduce the amount of time spent on an ironing chore. Freeing up your time for more fun things! You might be wondering why water tank capacity is important in irons and steam generator irons. Their capacity is important because it either makes life convenient for you (i.e. 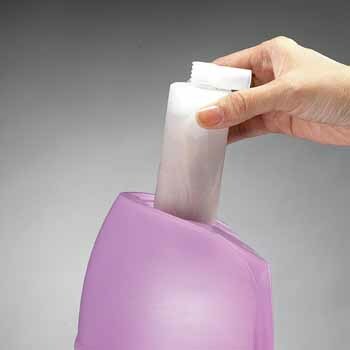 fewer refills) or it can make your ironing chore extra-long (i.e. continuously having to refill the small tank). The size of the water tank in the steam generator iron is a lot larger than the one in regular irons. A larger water tank means less frequent refilling with a lot more continuous ironing. 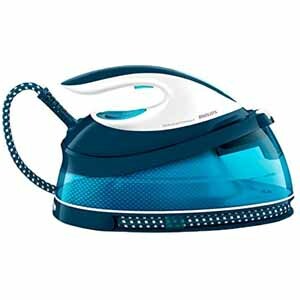 Some steam generator iron models have water tank capacity of up to 1.8 litres which means you can go on ironing for up to 2-3 hours if you so choose. Imagine how many times you’ll have to stop and re-fill the water tank in regular irons! The importance of steam pressure in an iron can never be underestimated. Steam pressure can help you have a love or hate relationship with the iron. An iron that has good steam pressure will significantly improve your ironing experience, whereas an iron with insufficient steam pressure will frustrate you. This is a very significant difference as the two appliances don’t deliver the same amount of steam pressure. The steam generator iron gives out extra pressure, controlled by pressing a trigger, more effectively removing creases from clothes than a normal steam iron. Taking all these differences into account, it can be said that steam generator irons are the ideal choice for people with large households, who have to get through large laundry piles weekly. It’s also a great choice for those who don’t have large households but simply want the best quality ironing results in the shortest possible time. This is not to say regular irons aren’t any good. Regular irons are compact and are less expensive when compared steam generator irons, and they are suitable for anyone who doesn’t need to iron too often. However, even the smallest ironing tasks can be significantly sped-up using a steam generator iron. As with choosing most appliances, steam generator irons present a huge amount of features for you to choose from. However, armed with the knowledge contained in this guide we’re sure you’ll be able to narrow your options down quite well. So the next time you unload your washing machine and are faced with creases and wrinkles a steam iron could be just what you’re looking for. Take a look at our comparison table to quickly evaluate our pick of the top irons. Check out the buyers guide to get a round up of the important features we think you should look for before buying.